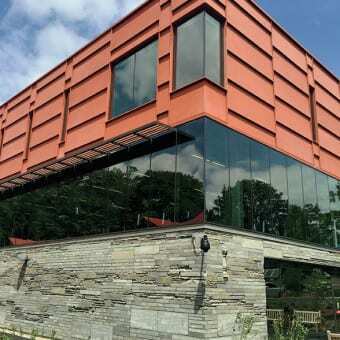 The Matchbox is Swarthmore’s newest building, nestled between the college’s athletic campus and the woods, and it provides 21,000 square feet of space to support wellness, fitness, and theater programming. The masonry-clad ground floor mediates the site’s unique topography, emerging from the earth, and includes heavy strength-training equipment and class and rehearsal space for the university’s theater department. The transparent first floor activates the street and sidewalk and includes a fitness room for strength training and cardio-vascular conditioning. 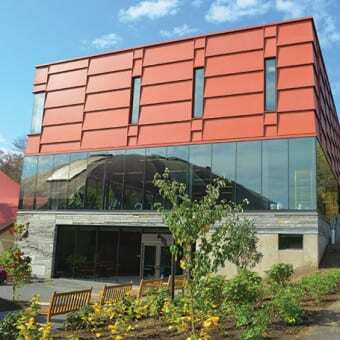 The solid second floor houses a multipurpose room for physical education, dance, and yoga classes, events, and large gatherings, and relates to both the red-roofed structures of the College’s athletic campus and the canopy of the forest. The new structure was built upon the footings, slab, and foundation walls of the old squash court building. 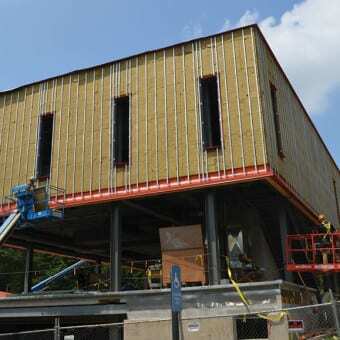 In addition to the foundation system, other materials from the squash building – such as wood roof joists and court floors and walls – were salvaged for reuse in the new facility. Stone off-cuts and pavers from 100 years of Swarthmore College buildings are re-purposed as exterior cladding.